Here are just a few facts you may be interested to know about Buck Lake. Buck Lake is essentially composed of two distinct water bodies, the North and South Branches, which are separated by a stream running under Perth Road through a culvert. The two branches are different shapes and sizes with different watershed sizes and bedrock geology. 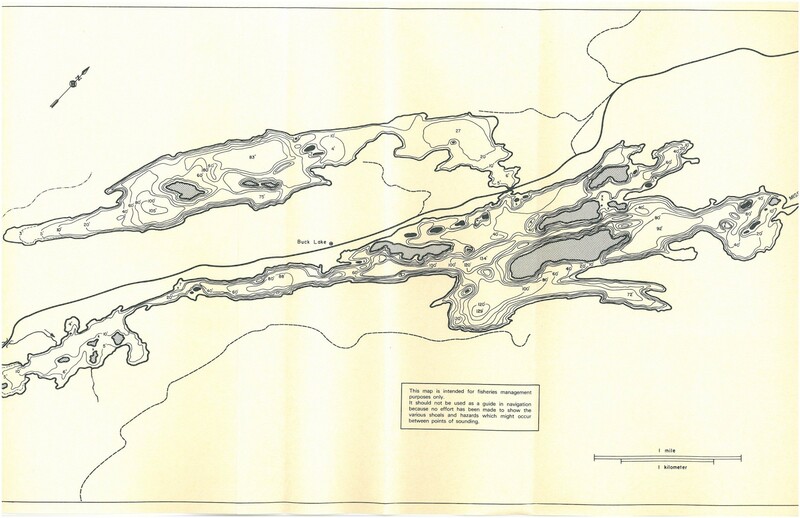 Buck Lake is approximately 30 kilometres north of Kingston, Ontario in Frontenac County (44° 31 N, 76° 27 W). 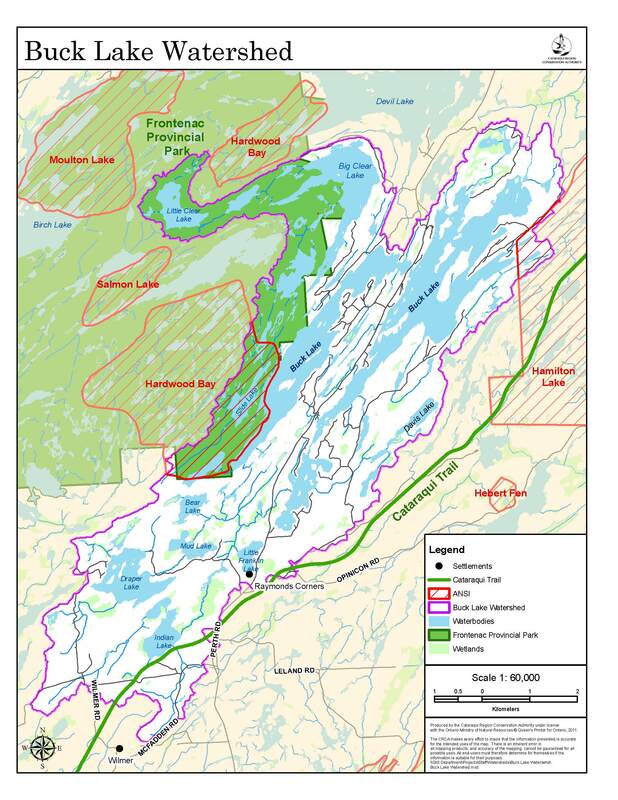 Buck Lake spans the boundaries of three districts, Loughborough, Bedford and Storrington, within South Frontenac Township. 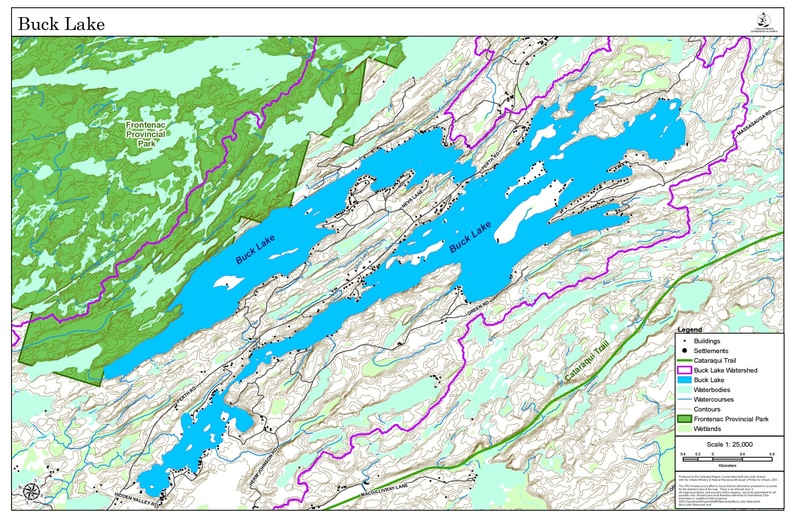 The North Branch has a surface area of 2.64 km2 while the South Branch has a surface area of 4.91 km2. The mean depths of the North and South Branches are 10.5 and 12.4 metres, respectively. The water level in Buck Lake is controlled by a dam on Massassauga Creek located at the north end of the South Branch. Fortis Power operates the Massassauga Creek dam and controls the levels to standards set by the Cataraqui Regional Conservation Authority. The dam is able to handle about 8 cubic metres per second and the elevation downstream is only marginally lower. In simple terms, it takes a long time to draw down Buck Lake on a good day. A significant portion of the western shore of the North Branch abuts Frontenac Provincial Park and the entire lake is included in the Frontenac Arch Biosphere, a UNESCO recognized site. In general, the lake has a rocky shoreline with steep slopes and the surrounding land is of poor agricultural quality, covered primarily in forest. A watershed refers to all lands that drain into a specific water body. Buck Lake is located in the Cataraqui River watershed, but the North and South Branches also have their own individual watersheds. The watershed that surrounds and drains into the North Branch has an area of 10.6 km2, while the South Branch watershed covers 51.28 km2. Approximately 25 streams drain into Buck Lake from the surrounding watersheds and a virtually incalculable amount of groundwater finds its way into the lake. The Canadian Shield, made up of Precambrian rock, covers an enormous portion of Canada. 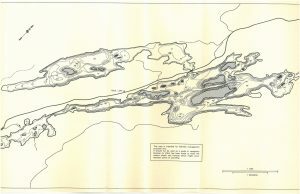 While the geology of the area around Buck Lake very much resembles the Canadian Shield, Buck Lake is situated on a narrow belt of Shield known as the Frontenac Arch in the Grenville Province of the Shield. The Frontenac Arch links the Adirondack Mountains of upstate New York with the Canadian Shield and separates the St. Lawrence Lowlands from the Great Lakes Lowlands. Limestone plains occupy these lowlands. 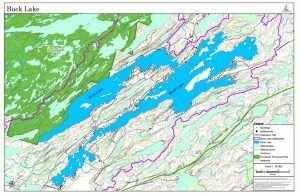 We tend to think of the geology of the region as being shaped by glaciers, but there are geological features in the Buck Lake region that have been dated at over one billion years old. Exposed Precambrian rock ( predominantly granite, quartzite, gneiss and marble) and small areas of glacial till (a mixture of unsorted rock fragments from clay to boulders deposited directly from glaciers without water transport) are characteristic of the area. The exposed Precambrian rock was left behind when glaciers scoured the area from about 75,000 years ago until they retreated about 12,000 years ago. The glaciers of the last ice age also created the myriad of lakes, ponds and wetlands in the region. The Frontenac Arch is home to some of the richest biodiversity in Canada. The Arch connects Adirondack Park in New York state with Algonquin Park and serves as a funnel for movement and dispersal of wildlife including wide-ranging mammals like the fisher. 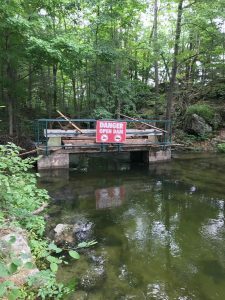 The Frontenac Arch is known, in particular for its high diversity of amphibians like salamanders, frogs, toads, and reptiles such as turtles, snakes and the only lizard in Ontario, the five-lined skink. The area is also home to a large number of rare and threatened species such as the common musk turtle, the least bittern, the cerulean warbler, the blunt-lobed woodsia (a fern) and the gray ratsnake. The flushing rates for the North and South Branches are 0.12 and 0.28 times per year, respectively. This is a measure of the amount of the lake’s volume that flows out of the lake each year. The North Branch clears all of its water every 8.3 years, whereas the South Branch does this every 3.6 years.